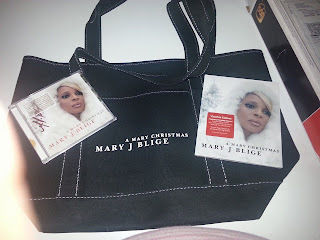 Bit O' Everything: Mary J. Blige NEW CD Release and Giveaway! Talking about the first AWESOME Christmas CD! Normally Christmas music isn't something that I'm into. However, Mary J. Blige changed that with her new CD. While I was listening to "A Mary Christmas" my mother even walked in and had one huge fit wanting the CD. Keep in mind, my mother is 55 years old and I'm 35. My children love it and they are ages 3, 12, 9, 14 and 15. The music is ABSOLUTELY MOVING AND BEAUTIFUL! This package actually made me feel very special when it came. I love the music and it came with the booklet that is 64 beautiful colorful pages about Mary and what she is all about. The tote, is a really THICK blue jean tote. I had to literally keep my mother from taking off with the tote. She wanted it too. This is the FIRST time in my life that I have actually came out and said NO to my mom. I think it was expected, but I love this tote and for several reasons. 1. Its a large size tote. 2. It's Blue Jean material. 3. It's got Mary J. Blige wrote on it. Be sure to follow Mary J. Blige on Twitter. The CD is one that the whole family will love. Each song has a great beat and its the type that will lift your spirits during the holidays. I've heard a lot of these songs done by other musicians before. Those were the type to put you to sleep or depress you due to the music or beats that are behind the vocals. Mary done the best job of all with these. They are not depressing. These are the type of songs anyone would love to have played in their car, home or even in a store. I've got to say, I absolutely love the CD as much as the Tote. I still have to say that #3 "My Favorite Things" is my all time favorite on the album! Iconic Grammy Award-winning singer, songwriter, actress and philanthropist Mary J. Blige has teamed up with the best musical talents in the business. Blige, for Matriarch Records/Verve Records/Interscope Records has completed her first-ever holiday album titled, A Mary Christmas making it the first album collaboration between Blige and legendary producer and Chairman of The Verve Music Group, David Foster. A Mary Christmas features Blige’s soulful interpretation of classic holiday tunes including “Have Yourself A Merry Little Christmas,” and “The Christmas Song.” Blige is joined by a number of A-list guests starting with Barbra Streisand, who duets with Blige on “When You Wish Upon A Star,” along with Jessie J on “Do You Hear What I Hear.” The Clark Sisters join Blige on “The First Noel” and “Noche de Paz,” is a Spanish collaboration with Mark Anthony. A Mary Christmas is set to arrive in stores on October 15, 2013.